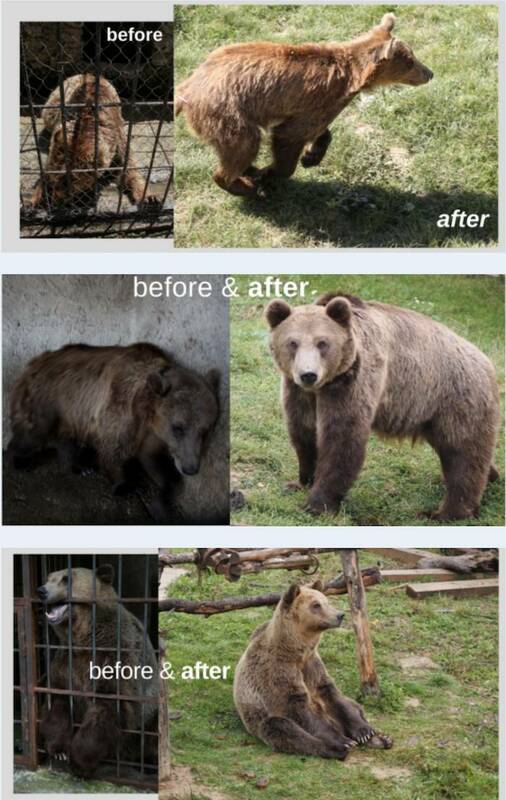 In September Four Paws rescued 3 bears from horrible conditions in Albania. Gjina, along with Tomi and Pashuk were transferred to our bear sanctuary Prishtina, where they are being provided with species-appropriate enclosures. Gjina is still spending more time inside than outside. But, compared to the first days following her arrival, the improvements she has made are immensely impressive. Our keepers noticed that she especially likes apples (perhaps she heard they keep the dentist away?! ), but, as yet, doesn’t seem to be thrilled by the activities our colleagues prepare for her. It's still all new to her though, so we shall continue to monitor her progress, and will watch with interest when she is ready to explore everything we can offer her. Since the very first day he arrived at our Bear Sanctuary, Tomi has been exceptionally relaxed. He enjoys everything about his new home, and eats every kind of fruit or vegetable our keepers offer him. Most of the time, you'll find Tomi outside, bathing in his pool and relaxing in the sun as if on vacation! He is really curious about every new experience he is offered. Tomi has a playful sense about him and gives our sanctuary caretakers plenty to laugh at and take pictures of! We are so happy for Pashuk, who has made great improvements since first arriving at the Bear Sanctuary. Initially, he hesitated to go outside, but now it seems that he feels comfortable in his outdoor enclosure. It’s hard to believe that only a few weeks ago he had a chain around his neck and lived in a small cage! Thankfully, the wound around his neck seems to have healed completely, and the fur is growing back fast. Pashuk loves spending time with his toys, and you often see him playing with one in particular: a big trunk…sprinkled with honey!